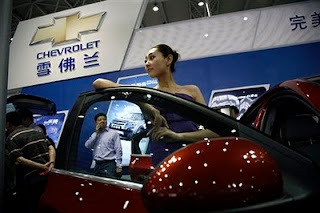 will watch GM’s IPO closely, and think carefully if we should purchase the shares or not. I am absolutely certain they would love to have a share . . . but they do not want to upset the US about this. On the other hand, the early days of GM’s IPO could see some US government-spurred irrational exuberance, and when reality sinks in, SAIC could well end up buying a big GM stake off the open market. After all, once the government releases its shares, it loses its ability to pick nix possible buyers for political reasons. Though GM has anti-takeover rules in its new Delaware-based corporate structure, an acquisition by a partner like SAIC would be considered friendly. And, in many ways, common sense. Though GM’s IPO may not immediately lead to a Chinese ownership stake, greater Chinese ownership of the bailed-out firm seems extremely likely over the medium-to-long term. A GlobalAutoIndustry.com Online Seminar to assist you with doing business in or with China. Taken collectively, it is clear these trends signal a shift in the global center of gravity towards the east. The dramatic shifts that have occurred over the past year in the structure and brand portfolios of the vehicle manufacturers are simply the early stages of a process of asset reallocation and global realignment that will unfold over many years. These trends are reshaping the brands, products and global footprint of those who hope to prosper in the 21st century automotive industry. Indeed, China has taken center stage in the battle for global auto industry dominance. The Online Seminar guest presenter is Bill Russo (see Speaker's Bio below). This Online Seminar is for foreign-based companies doing business in or with China. Attend any 5 Online Seminars for $179!